If Clinton wins tonight, she’ll be breaking a historic pattern. And no, I’m not talking about being the first female president. Some political statisticians believe in a "metronome" pattern. Basically, they weigh outcomes according to election cycle trends, and the previous government that was in power — a pendulum swing kind of deal. So if we consider that we’re just coming out of two terms of Democrat Barack Obama in the Oval Office, it stands to reason (at least to folks subscribing to the "party fatigue" theory) that the pendulum should swing the opposite way … and to the Republicans. Historically, it’s been very tough odds in modern presidential history for a three-peat. The last time the same party occupied the White House for three consecutive terms (since 1950) was in 1988 when George H.W. Bush won for the Republicans, following two terms in which Ronald Reagan was president. Here it is. The famous glass ceiling at the Javits Center in Manhattan’s Hell’s Kitchen neighbourhood that you've been hearing about. It is pretty, but also very bright in here. There are huge American flags draped everywhere. Some quick info. 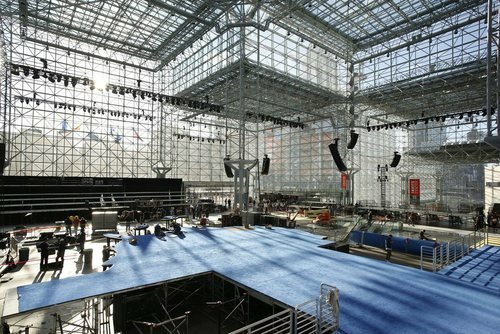 : The Jacob K. Javits Center opened in 1986 and occupies six city blocks. According to its website it is "the country’s busiest convention centre." There is a long line of supporters outside. We spoke to the first person in line, Daniel Hurd. He and his husband arrived at 5:00 a.m., even though doors to the public don't open until 6:00 p.m.. At one point someone tried to jump in front of him "and I [wasn't] going to let that happen. Had to get the police involved," he said. Tensions are high but so is the feeling of confidence among the Clinton supporters I spoke with that their candidate will win. Final fact: We have been told we have to be out of here by 9:00 a.m. at the latest tomorrow – even if the election results are still not in – because there is another event booked. Here’s hoping we will all be long gone before then. 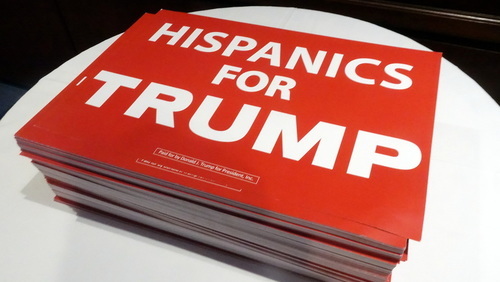 Trump has supporters everywhere - even in Canada. 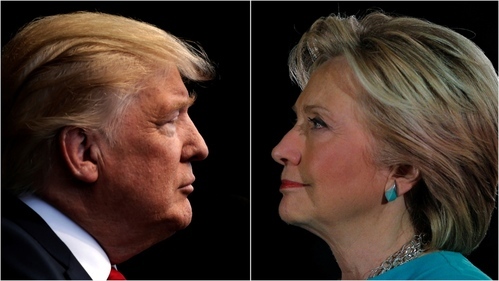 As much as 40 per cent of commenters discussing the election in Canada over the past three months are favourable of Trump’s policies or make comments stating that they dislike Hillary Clinton. However, when we narrow down our search to the specific words people say about each candidate a different trend emerges. When discussing whether a candidate is unfit to be president or unsuitable for the job, 93 per cent of commenters are speaking about Trump. 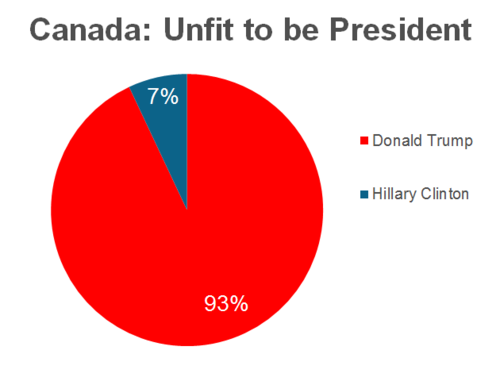 Canadians are about as likely to think Donald Trump is unfit to be president as our American counterparts. In the U.S., this metric ranges between 89 per cent and 92 per cent on any given day. Where Canadians diverge from Americans on Twitter is in our discussion of what we feel are important issues. The Clinton email scandal ranks sixth here, not first, and is below foreign policy, the economy, terrorism, ISIS and immigration. Discussions about health care spike whenever either candidate is critical of Canada’s single-payer universal health system. Patriotism is alive and well on this issue! Election officials in three Pennsylvania counties said they believed no ballots had been wrongly counted as a result of computer malfunctions, despite reports on Tuesday that touch-screen voting machines in the state were switching votes. Officials in Cumberland, Perry and Butler Counties in Pennsylvania told Reuters that they had no reason to believe the mistakes were affecting voters from one party more than the other, and that voters were catching the mistakes on "review screens" before their ballots were cast. There's no central Elections Canada-style body in the U.S. Elections are governed at the state level and many cities and counties have their own systems. In fact, there are more than 10,000 different voting jurisdictions. That's why Americans vote on different kinds of machines. None of those machines are connected to the internet. A decentralized system is why officials believe a centralized, cross-country cyber hack on the election would be impossible. Well, CBC News is finally inside Trump election night headquarters. The backstory: We learned we'd be allowed in only this morning after first being denied accreditation (a first for CBC at any U.S. election night headquarters) because, as the Trump people told us, there wasn't enough room -- and indeed it’s not the biggest location on Earth -- but sometimes lobbying pays off. And as of right now, here we are. 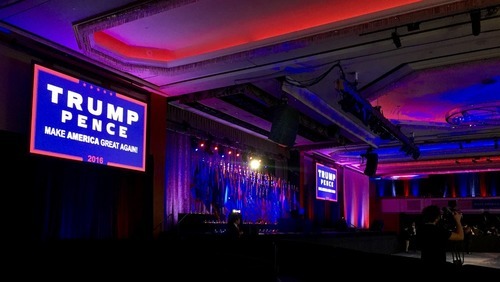 So in theory, win or lose, Donald Trump will walk out onto that stage later tonight and say ‘Thank you for electing me president!” or “Congratulations Hillary” -- or neither. Remember the third debate with Clinton when he suggested he may contest the vote if he doesn’t win? (‘It’s rigged!’) Not to mention, if he accepts defeat, word today is that even his inner circle doesn’t know whether his speech will be gracious and conciliatory, or mean-spirited and combative. Gonna be an interesting night! There are a lot of stressed out election staffers in Cincinnati. There's a scene of (slight) chaos at the Hamilton County Board of Elections. This is ground zero for voting issues in Cincinnati. Staffers are taking calls from residents who aren’t sure of their counties, don’t have proper ID, sick calls from employees, et cetera. It's a long night ahead for the vote counts. Trump supporters have been nearly twice as likely to say they’ve voted as Clinton supporters. Based on our year-long analysis of Twitter, we’ve seen that Trump has 300 per cent more support on the platform than Clinton generally, and as much as 600 per cent more social media engagement than Clinton. It is a powerful endorsement for a Twitter author to make to their followers; the Edelman Trust Barometer this year found that people trust online influencers more than traditional media, politicians or even CEOs. 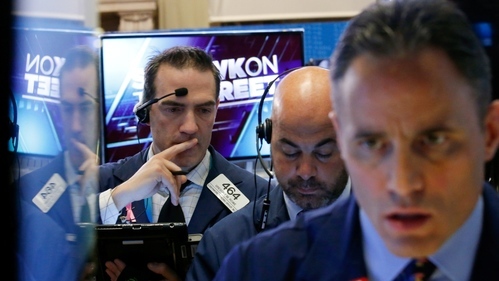 On a day that saw U.S. voters go to the polls, indices on Wall Street finished in positive territory for a second straight day, while the S&P/TSX composite index was nearly flat. North Carolina had a laptop issue today. All of the laptops in 77 precincts seemed to fail, something about "check-in software." So, the decision was made to go back to paper ballots. But, now those are running out. That means growing lineups. Some reports say people got fed up and left to go back to work. Will they come back? There is an application to extend voting hours. This isn't the only state where paper is making a return. It's largely because the machinery is old and in need of repair. Here's where it gets all very ironic. Most of that machinery was bought for states after the nightmare election of 2000 when the "dimpled" or "hanging chads" of Florida's paper ballots made voting imprecise and controversial. Machines would save the day. But many of them haven't been updated since 2000, a century in tech years. So, they are failing and unreliable. And it's back to paper. Deep breaths our American friends ... deep breaths. As I mentioned earlier, the District of Columbia, with three electoral votes, is overwhelmingly Democratic. The website FiveThirtyEight.com projects a more than 99.9 per cent certainty Clinton will win here. 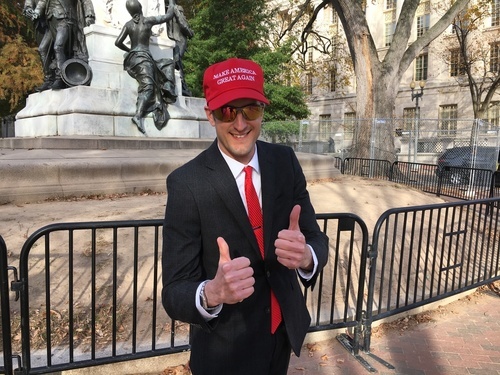 But on Pennsylvania Avenue this afternoon, Brian, a Trump supporter and federal contractor, said he feels "extremely confident" that his candidate will be the agent of change that Washington needs. "I’m 'anti-establishmentarian,' I think is the word for that. I just want some form of change. I would have happily voted for Grover Cleveland if he were around, or Grover the Muppet. Just somebody from the outside," he said. With the White House behind us, Brian said he can already envision Trump in the Oval Office. 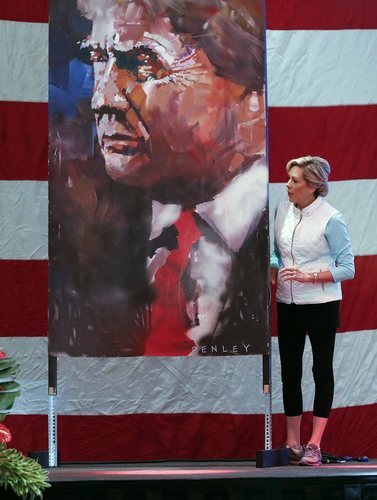 "I can see how glorious it looks already," he said, joking that the president’s residence could also use some redecorating. "It absolutely needs more gold." The story so far: U.S. election day got off to a rough start with reports of long lines, voting machine problems and a lawsuit from Donald Trump. A North Carolina advocacy group on Tuesday filed a lawsuit asking that polls in Durham County be kept open until 9 p.m. after problems with electronic voting rolls there earlier in the day, according to a court filing provided by the group. Democracy North Carolina filed the case in a state court, shortly before the state board of elections is set to decide whether voting in Durham County should be extended. It's been mostly smooth voting in Florida marred by a few nasty events, according to local media. 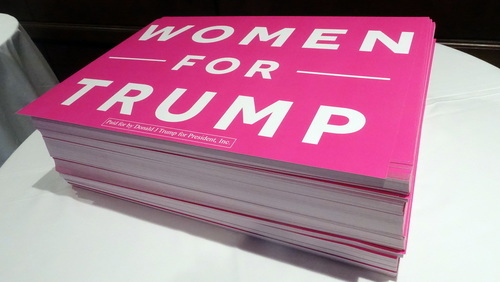 Palm Beach Post reported Donna Tatlici was passing out Trump literature at a polling station in Palm Beach when a Clinton supporter aggressively objected. When Tom Garrecht "came right into my face" shouting expletives, Tatlici says, she pepper sprayed him, then he tackled her. No major injuries but evidence of high emotion in this deeply divided state. Two volunteer election officials were let go in Pompano Beach after "interfering with election," says a Broward County election official. 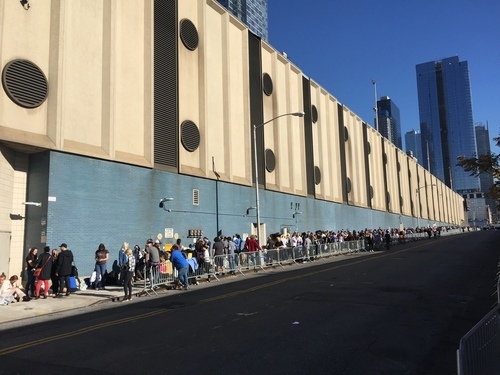 But nothing like 2012, when voters waited hours in line as precincts couldn’t handle the surges in voting. 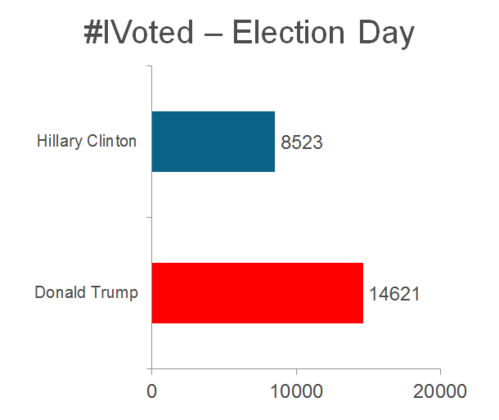 Florida responded with more precincts and two weeks of early voting. 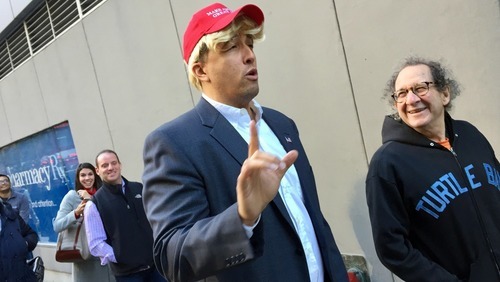 New York is a solidly Democratic state, but you can find Donald Trump supporters around. John A. Gill Jr. came from Mississippi on business and says he thinks it's time for a change. "I think Hillary lies a lot. 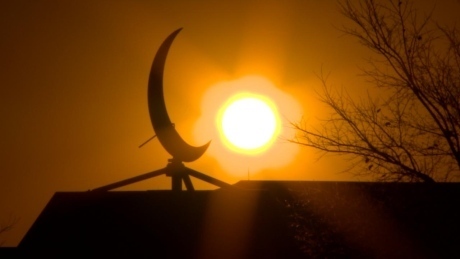 The country is not first in her mind, she is first in her mind." He says he wants someone who will cut taxes and bring back jobs. 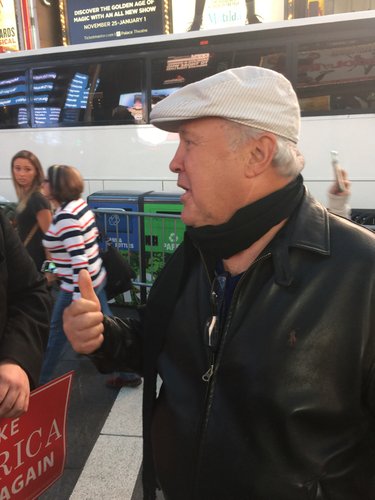 He says if Trump loses "we'll just have to make the best of it," and he says he'd like to see Trump start his own TV network to compete with Fox News and keep Hillary honest. There is lots of speculation over whether Trump, if he loses, will concede. He has certainly hedged on this point. (“I’ll keep you in suspense,” he said at the last debate). Legally, however, it’s a moot point. The losing candidate doesn’t have to concede to make the election results official. The electoral college is the formal body which elects the president and vice-president. A concession has just become more of a tradition, an act of graciousness on behalf of the losing candidate. "It doesn't have any independent legal effect," Rick Hasen, a University of California-Irvine professor who runs the popular Election Law Blog, recently told CNN. "If he concedes or he doesn't concede, the votes totals will be what they will be." Democratic Party officials said they were not seeing concerted, systemic voter suppression efforts on Tuesday as Americans continued to cast ballots. But civil rights groups reported higher levels of voter intimidation complaints than in prior presidential elections, based on more than 20,000 calls they had received from around the country to a voter complaint hotline as of Tuesday afternoon. 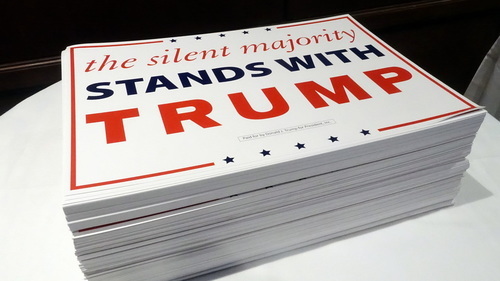 These stacks of placards are ready to be handed out to guests at Trump's election night headquarters in Manhattan. Just a guess, but it strikes me there are more placards than there is space in the ballroom for people to wave them. Why the American flag tank-top? Olivia Baxter, 19, says she wanted to make a statement. 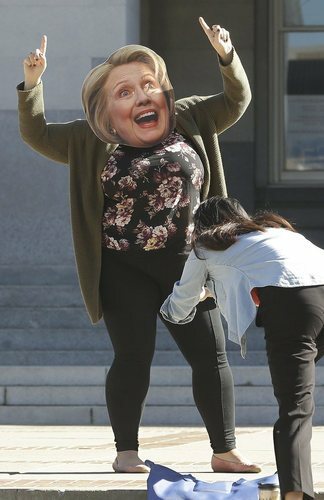 After all, it was her first time ever voting. And the stakes, she said, couldn’t be higher. "It’s a big burden for a young person," she says outside a polling station in downtown Phoenix. "I feel like I made a decision that might dictate the rest of America’s future." Baxter, a student at Arizona State University, says the stereotype of millennials as politically disinterested is only partially true. She says it’s because neither Hillary Clinton nor Donald Trump have made enough effort to court their vote. "I feel that when people reach out to young people, that brings out their voice," she says. "I don’t think young people are involved in politics because I don’t think a lot of people are interested in what we have to say." She says many millennials like her are more likely to get their political cues from actors and musicians than politicians. "There’s been some songs that have come out that a lot of us listen to, hip hop songs that are saying like f--k Donald Trump and stuff like that," she says. "I voted for Hillary Clinton. I’m with her!" "First lady president. And, I don’t know… f--k Donald Trump!” she says, laughing, and she walks back towards her dorm. By the way, can you believe this thing has been going on for a year and a half?! For a refresher, CBC News asked me (along with archivist Greg Hobbs and editor Claude Panet-Raymond) to put together a kind of highlights reel of the campaign. We were asked to keep it brief (curses!) so we dispensed with the primaries and began when the contest REALLY started -- at the end of the nominating conventions. The piece runs about 5-1/2 minutes. Spotted in a lineup of voters in Manhattan this morning. You be the judge. Instead, they voted for Republicans down the ballot, the spokesman said. There had been some speculation that Bush might vote for Clinton after Jeb Bush's son (W.'s nephew) said that it was likely his uncle would vote for the Democratic presidential candidate. The Bush family is certainly not keen on Trump, who has been critical about the former president in regards to the Iraq invasion (Trump said Bush had lied about WMD, but later denied it) As well, Trump was particularly bruising against Jeb Bush during the primaries. 2. Voting day can seem almost anti-climatic. After two weeks of advance voting, with long lines and marching bands, some of the precincts looked a bit lonely. 3. The ballots are huge. Candidates for president, Congress, the Senate, local mayoralty races, city councillors and constitutional amendments like solar power in Florida, and the use of medicinal marijuana. Okay that last one sounds pretty familiar. 4. Winner takes all. Get the most votes in one state and you scoop up all the electoral college votes, which makes Florida with 29, a big get. 5. At least half a million Canadians own property in Florida, but of course they’re not voting, just watching intently. There are disenfranchised American citizens and nationals who cannot vote in general elections. This includes the four million American citizens and U.S. nationals living on the U.S. island territories of Guam, American Samoa, Northern Mariana Islands, the U.S. Virgin Islands and Puerto Rico. Also counted out on Election Day? Some 6.1 million Americans prohibited from voting due to laws that impose bans on voting for citizens convicted of felony offences, according to the Sentencing Project, a non-profit focusing on criminal justice reform. The Mexican peso climbed almost 1.4 per cent on Tuesday to 18.32 per US dollar, its highest level since Sept. 8, on bets that Hillary Clinton will win the U.S. presidential race, Reuters reports. 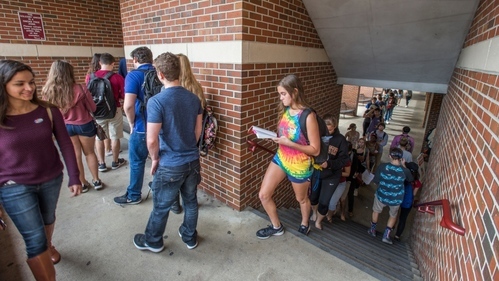 What will happen at 7:30 p.m. in Hamilton County when the polls close? It's different across the state, but once every voter has handed in their ballot they are scanned into the system. The data is recorded onto computer chips that are brought physically down to the Board of Election. All of those chips are then entered into a master computer here to be tabulated. If voters arrive at the polling station before 7:30 and there is a line, the station will stay open until everyone votes. 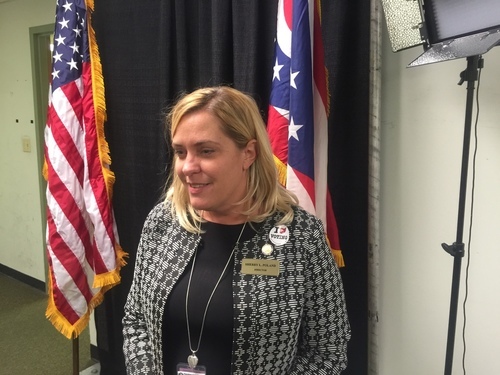 Sherry Poland, director of Hamilton County Board of Elections, say they are expecting turnout of around 70 to 75 per cent, which is typical for a presidential election. She says at this point there are no reports of voter intimidation in this county and things seem to be going smoothly. 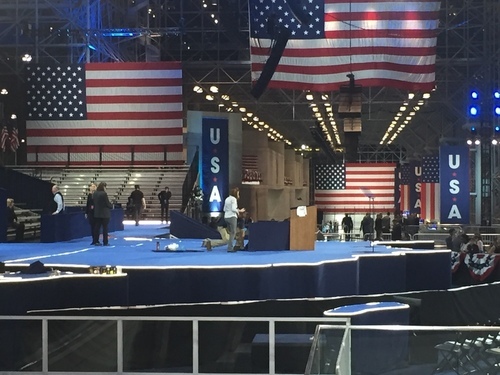 The stage at the Javits Center in Manhattan, where Hillary Clinton will speak this evening, is cut in the shape of the map of America. "We think she is going to make history here tonight," said Kristina Schake, deputy communications director for the Clinton campaign. "We wanted to build a stage that really represented the United States and a place for a real celebration."